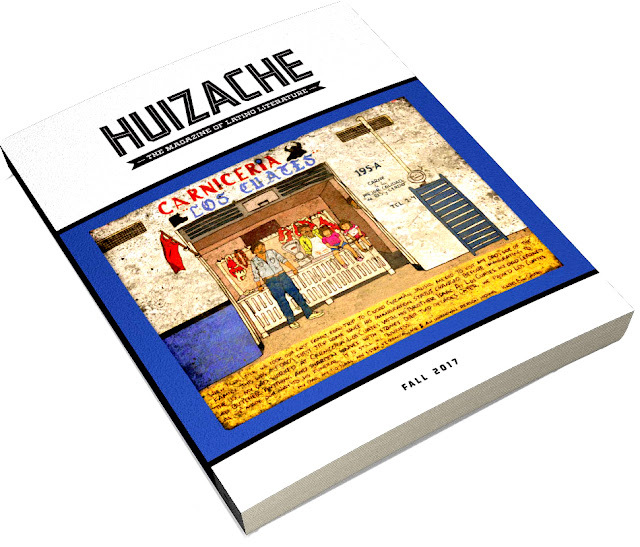 HUIZACHE has become, according to several among its small crew of editors, designers, proofreaders and support staff, the nation’s leading Latino literary magazine, easily home to world-class poetry, fiction, and essays from the original American West. Subscribers and long-time readers of the seven-year-old publication are thrilled, they say, at the launch yet another blockbuster issue featuring writers from the established Latino literary cannon and, as always, new voices with cutting-edge talent impossible to ignore. “Today, the West and Southwest are exploding with art and culture rooted in centuries of tradition and fueled by history and a new contemporary culture. The cities that once circumscribed our western frontier—El Paso, San Antonio, Chicago, Denver, Tucson, Austin, San Francisco, Juárez, San Diego, Fresno, and Los Angeles—are pounding with life,” says HUIZACHE founding editor Dagoberto Gilb, an acclaimed writer who also directs the CentroVictoria: Center for Mexican American Literature and Culture, set up to umbrella the magazine while providing educational programs and opportunity for students and the community in Victoria, Texas. “Those places are being renewed by fresh voices and faces who are inspired by the sights, sounds and music of their own culture and times. Their not outsiders searching for ‘exotic’ accents. They are the local voices of storytellers and poets whose families have called those cities home for generations,” Gilb says emphatically. These gifted, emerging voices are no longer waiting to be discovered by New York, Gilb explains, and HUIZACHE both generates and memorializes the movement their coming of age represents. It is an awakening that has spawned a virtual torrent of literary genius that just can't be ignored. Alongside their established literary forerunners and the masters they claim, he argues, next wave writers are rightfully being recognized for the fiction, poetry and essays that make that movement and magazine supporting it what what they are. “It’s not just because HUIZACHE seeks and finds and gathers and publishes what no other literary magazine in the country does, beautifully, but because the poems, stories, and essays inside are as good as any in the best magazines or journals anywhere,” Gilb adds with an unfiltered urgency. Not content to rest on his hard-won laurels as a towering literary figure in American letters or an outspoken advocate on behalf of diverse writers, he has often forgone his own work as an author to ensure that each issue of HUIZACHE resonates with the power and beauty of compelling narrative. “Every issue has engaging poetry, arresting fiction, artwork, and amazing covers by artists such as Patssi Valdez, Linda Gamboa, and... John Valadez,” writes Sedano, whose unabashed, often unsung efforts as a one-man literary booster, cheer section and archivist-historian on behalf of the Latino literati stretches back all the way to the original “Floricanto” poetry festivals held at the University of Southern California in the early ’70s. The seventh issue of HUIZACHE features cover art by emerging Latinx illustrator Isabel Castro, a young San Antonio native and a spellbinding collection of work from critically acclaimed writers and internationally prominent literary icons Sandra Cisneros, Gary Soto, Dagoberto Gilb, and Alicia Gaspar de Alba. There isssue also features several less prominent wordsmiths, among them: Tucson’s Farid Matuk and Cassie Gonzales, LA’s Raquel Gutiérrez, Mexico City’s Gabriela Jauregui, San Diego-bred veteran Taco Shop Poet Adolfo Guzmán-López, and Utah-born Mario Chard. Illustrations are from comic book legend Jaime Crespo, and the young Daniel Parada and Breena Nuñez Peralta—art that was curated by Latino Comics Expo co-founder Ricardo Padilla. Contributing author biographies and a modest survey of original literary works successfully submitted for publication in each of the six previously published editions are available to the public at www.huizachemag.com, a site which does NOT require a login registration for access. To order copies of the stunning, recently delivered and still hot off the press h7, or to take advantage of a special 20% -off promotional discount on the purchase of the complete HUIZACHE Magazine collection that includes all seven issues published thus far, please visit www.centrovictoria.net/huizache.html. For a PDF review copy of h7 or for information on hosting or co-sponsoring a HUIZACHE reading/release event to highlight and market the new issue; or to incorporate an author signing/sales event featuring locally-based or nearby writers who contributed to h7 or who've had work published in any of the last three editions, please send an email c/o Publicity & Events to: abel@huizachemag.org or leaved a voice mail at (213) 321-7115.